Metal connectors, fasteners and anchors can corrode and lose carrying capacity when installed in corrosive environments or when installed in contact with corrosive materials. The many variables present in a building environment make it impossible to predict accurately whether, or when, corrosion will begin to reach a critical level. This relative uncertainty makes it crucial that specifiers and users be knowledgeable about the potential risks and select a product suitable for the intended use. When there is any uncertainty about the possible corrosion risks of any installation, a qualified professional should be consulted. Because of the risks posed by corrosion, periodic inspections should be performed by a qualified engineer or qualified inspector and maintenance performed accordingly. It’s common to see some corrosion in outdoor applications. Even stainless steel can corrode. The presence of some corrosion does not mean that load capacity has been affected or that failure is imminent. If significant corrosion is apparent or suspected, then the wood, fasteners, anchors, and connectors should be inspected by a qualified engineer or qualified inspector. Replacement of affected components may be appropriate. Because of the many variables involved, Simpson Strong-Tie cannot provide estimates of the service life of connectors, anchors, and fasteners. We suggest that all users and specifiers obtain recommendations on corrosion from the suppliers of the materials that will be used with Simpson Strong-Tie products, in particular, treated wood or concrete. We have attempted to provide basic knowledge on the subject here, and have additional information in our technical bulletins on the topic (Product Use Information). 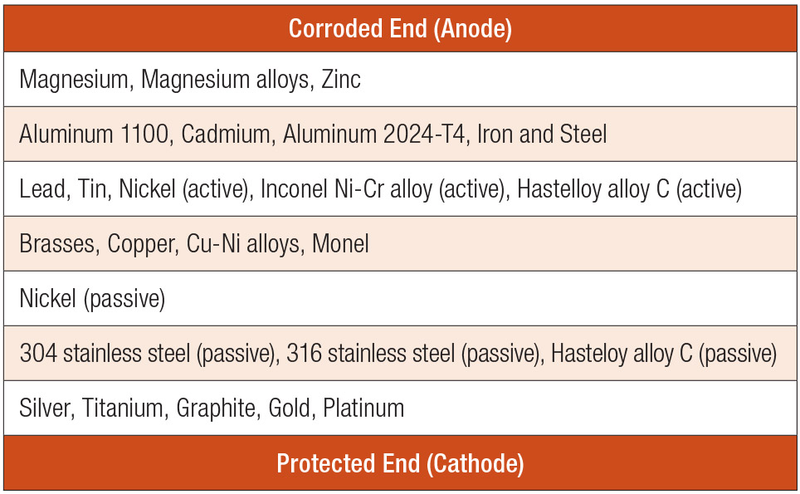 Corrosion can result from many combinations of environmental conditions, materials, construction design, and other factors, and no single guideline addresses all corrosion possibilities. Nevertheless, important corrosion information can be obtained from the American Wood Protection Association (AWPA), the International Building Code (IBC), International Residential Code (IRC), and local building codes. The following discussion provides general guidelines and approaches for the selection of Simpson Strong-Tie products for various construction conditions, but is not intended to supersede the guidelines of the AWPA, IBC, IRC, or local building codes. Many environments and materials can cause corrosion, including ocean salt air, condensation, duration of wetness, fire retardants, fumes, fertilizers, chlorides, sulfates, preservative-treated wood, de-icing salts, dissimilar metals, soils, and more. Designers must take all of these factors into account when deciding which Simpson Strong-Tie products to use with which corrosion-resistant coatings or materials. The design, quality of construction, and misinstallation can directly affect the corrosion resistance of products. A product intended and installed for use in dry-service environment may corrode if the structure design or building materials allow moisture intrusion, or expose the product to corrosive conditions, such as moisture or chemicals contained in the construction materials, soils, or atmospheres. Some wood-preservative or fire-retardant chemicals or chemical retention levels create increased risk of corrosion and are corrosive to steel connectors and fasteners. For example, testing by Simpson Strong-Tie has shown that ACQ-Type D is more corrosive than Copper Azole, Micronized Copper Azole, or CCA-C. At the same time, other tests have shown that inorganic boron treatment chemicals, specifically SBX-DOT, are less corrosive than CCA-C.
Because different chemical treatments of wood have different corrosion effects, it’s important to understand the relationship between the wood treatment chemicals and the coatings and base metals of Simpson Strong-Tie products. The preservative-treated wood supplier should provide all of the pertinent information about the treated wood product. The information should include the AWPA Use Category Designation, wood species group, wood treatment chemical, and chemical retention. See building code requirements and appropriate evaluation reports for corrosion effects of wood treatment chemicals and for fastener corrosion resistance recommendations. With Fire-Retardant-Treated (FRT) Wood, the 2015 and 2018 IBC Section 2304.10.5.4 and 2015 and 2018 IRC Section R317.3.4 refer to the manufacturers’ recommendations for fastener corrosion requirements. In the absence of recommendations from the FRT manufacturer, the building codes require fasteners to be hot-dip galvanized, stainless steel, silicon bronze or copper. Simpson Strong-Tie further requires that the fastener is compatible with the metal connector hardware. Fastener shear and withdrawal allowable loads may be reduced in FRT lumber. Refer to the FRT manufacturer’s evaluation report for potential reduction factors. If you are uncertain about the galvanic corrosion potential of any installation, always consult with a corrosion expert. See the product pages for particular parts for more information regarding what coating systems are recommended or required for use with the parts in question. Some hardened fasteners may experience premature failure from hydrogen-assisted stress-corrosion cracking if exposed to moisture. These fasteners are recommended for use only in dry-service conditions. Simpson Strong-Tie connectors, anchors and fasteners feature a wide range of materials and coatings designed to meet specific performance criteria. It is important to select a material and/or coating that is suitable for the intended application and environment based upon factors such as corrosion resistance and mechanical properties of the material. 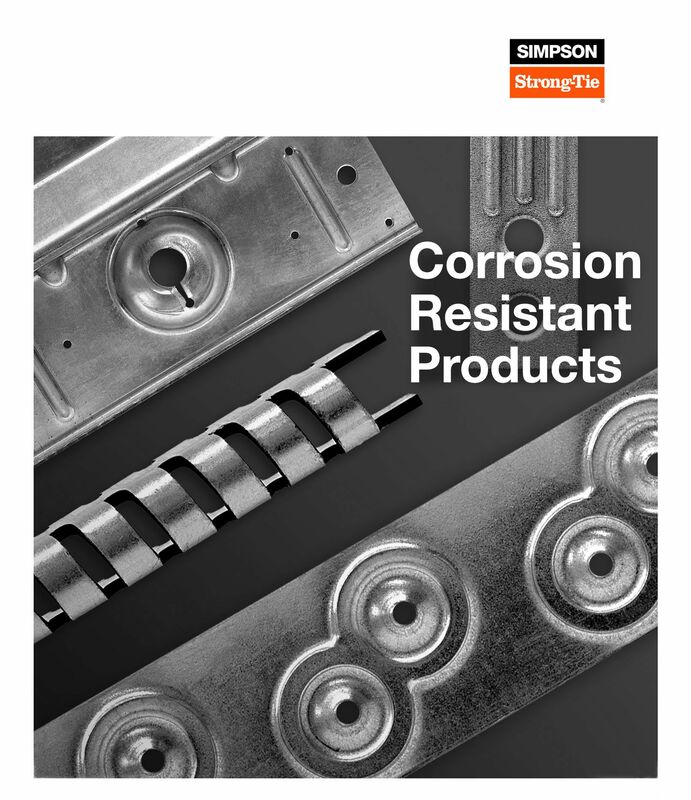 For more information on selecting connectors, anchors and fasteners based upon corrosion resistance, please see Corrosion Information for Connectors and Fasteners, and Corrosion Information for Anchoring Products. If the treatment chemical information is incomplete, Simpson Strong-Tie recommends the use of a 300 series stainless steel product. Also if the treatment chemical is not shown in the Corrosion Classification Table, then Simpson Strong-Tie has not evaluated it and cannot make any recommendations other than the use of coatings and materials in the Severe category. Manufacturers may independently provide test results of other product information; Simpson Strong-Tie expresses no opinion regarding such information. Always consider the importance of the connection as well as the cost of maintenance and replacement. If the information about treatment chemicals in an application is incomplete, or if there is any uncertainty as to the service environment of any application, Simpson Strong-Tie recommends the use of a Type 300 Series stainless steel. Simpson Strong-Tie has evaluated the corrosion effects of various formulations of wood treatment chemicals ACZA, ACQ, CCA, MCA, CA, and salt as corrosion accelerators. Simpson Strong-Tie has not evaluated all formulations and retentions of the named wood treatment chemicals other than to use coatings and materials in the severe category. Manufacturers may independently provide test results or other product information. Simpson Strong-Tie expresses no opinion regarding such information. Type 316/305/304 stainless-steel products are recommended where preservative-treated wood used in ground contact has a chemical retention level greater than those for AWPA UC4A; CA-C, 0.15 pcf; CA-B, 0.21 pcf; micronized CA-C, 0.14 pcf; micronized CA-B, 0.15 pcf; ACQ-Type D (or C), 0.40 pcf. When wood treated with micronized CA-C and micronized CA-B with treatment retentions up to UC4B is in dry service, hot-dip galvanized fasteners and connectors may be suitable. Mechanical galvanizations C 3 and N2000 should not be used in conditions that would be more corrosive than AWPA UC3A (exterior, above ground, rapid water run off). Some chemically treated wood may have chemical retentions greater than specification, particularly near the surface, making it potentially more corrosive than chemically treated wood with lower retentions. If this condition is suspected, use Type 316/305/304 stainless-steel, silicon bronze, or copper fasteners. Some woods, such as cedars, redwood, and oak, contain water-soluble tannins and are susceptible to staining when in contact with metal connectors and fasteners. According to the California Redwood Association (calredwood.org), applying a quality finish to all surfaces of the wood prior to installation can help reduce staining. Anchors, fasteners and connectors in contact with FRT lumber shall be hot-dip galvanized or stainless steel, unless recommended otherwise by the FRT manufacturer. Many FRT manufacturers permit low-corrosion-resistant connector and fastener coatings for dry-service conditions. Simpson Strong-Tie does not recommend painting stainless-steel anchors, fasteners or connectors. Imperfections or damage to the paint can facilitate collection of dirt and water that can degrade or block the passive formation of the protective chromium oxide film. When this happens, crevice corrosion can initiate and eventually become visible as a brown stain or red rust. Painting usually does not improve the corrosion resistance of stainless steel.